St Joseph, the patron saint of Sicily is celebrated on the 19th March every year all over Italy. Palermo, a town in Sicily, puts together a feast referred to as tavolata di San Giuseppe, or St. Joseph’s table which consists of tutto quello che esiste (everything that exists), including every type of fruit and vegetable and fish. The reason St Joseph is loved is because during the Middle Ages a severe drought struck Sicily. The locals prayed to St Joseph for rain to grow their crops. Their prayers were of course answered and so each year the saint is honoured with this feast. It is not uncommon to this day for Italians to pray to St. Joseph for divine intervention for ill loved ones and there is always a promise to prepare La Tavolata as thanks. St Joseph’s donuts are always included in this feast which will be blessed by a priest and shared communally with the town. 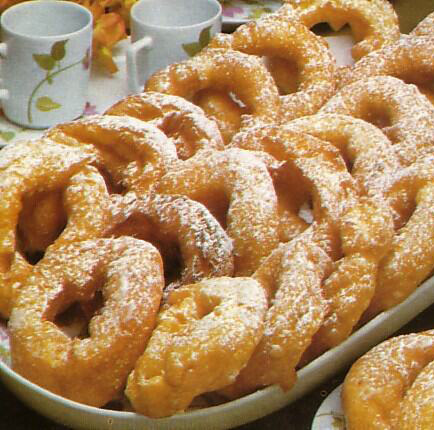 This delicious Italian donut recipe will soon become a family favourite. Bring a pot of 750 ml water to boil and add a pinch of salt. Add the rice and cook until all the water has been absorbed. Set aside to cool. In a large bowl, mix the rice, flour, milk and yeast until well combined. Leave the mix to stand for about ½ hour. With a spoon, shape the dough into small quenelles and fry in a deep fryer (or similar) until golden brown on all sides. Remove the zeppole from the oil and drain on absorbent paper. In a separate bowl, mix the orange juice, zest and honey. Dip the zeppole into the honey mixture until well coated. Serve with a sprinkle of cinnamon and icing sugar. Enjoy every delicious bite and don’t forget to like your fingers after!